Alpha-linelenic acid (ALA) found in English walnuts and vegetable oils like flaxseed, soybean and olive which the body eventually, but in small quantities, converts to DHA. Be aware that only about one-third of the oil from fish is rich in EPA and DHA. Many supplements also contain vitamin E or other antioxidants to stabilize the oils and prevent them from becoming rancid. If you choose to buy a fish oil supplement, check the label carefully to see if it recommends refrigeration to prevent spoiling. Most brands of fish oil have been proven safe, free of detectable traces of mercury, and do not contain unsafe levels of PCBs (polychlorinated biphenyls), a toxin and pollutant believed to pose various health threats. To avoid contaminants in an unrefined supplement, it's best to choose a fish oil supplement made from small, oily fish like anchovy, sardines or menhaden. Lubricates joints Helps provide the lubrication joints need to function at an effective level. By keeping joints lubed, you experience less grinding and less overall wear and tear - and thereby - less pain as you age. Fights wrinkles As we age, fat cells in our skin's third layer thin out and tend to get a bit bumpier; omega-3s help make that layer thicker and smooth. The effect? Wrinkles go away and skin becomes fuller. Protects Vision Our eyes' retinas are a membranous structures and the whole eye is covered in a soft double layer of membranes, making your eyes' health dependent on the liver (who knew?). The liver helps metabolize fat-soluble vitamins that feed and maintain those membranes. If you're deficient in DHA, it affects how we see by delaying the system that converts light into neural energy in the retina. Pumps the heart Where to begin?! 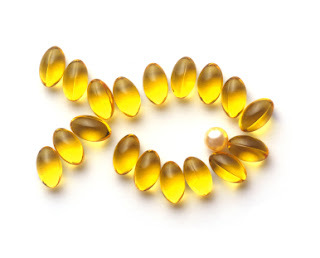 Omega-3s reduce triglycerides, stabilize your heartbeat, make platelets "less sticky" and can even lower blood pressure. The EPA you get with your daily DHA dose helps prevent artery-blocking clots. In the Iowa Nurses Study (and 3 others), 1 ounce of nuts a day decreased the incidence of heart disease between 20 and 60%. Attacks Acne It may surprise you to know that an inadequate intake of omega-3 fatty acids contributes to breakout-prone skin. Trade sugar (and meat) for avocados, walnuts, salmon or trout to help control acne. Clears Cholesterol Boosts levels of HDL (the good cholesterol) and helps clear your arteries. Boosts the Brain In keeping your arteries clear, you're immediately improving brain function. They also alter your neurotransmitters to help reduce depression. Enhances Fertility Improves fertility rates in both males and females by improving sperm's swimming ability and the environment for implantation in women. A Pregnancy Prerequisite Omega-3 fatty acids directly affect brain development, making it crucial for expectant mothers. Additionally, research indicates they decrease a mother's risk of depression. When the mother doesn't have enough of these essential fatty acids, the baby borrows from her. Some prenatal vitamins now include omega-3s, so be sure to check the label or grab a handful of walnuts each day.